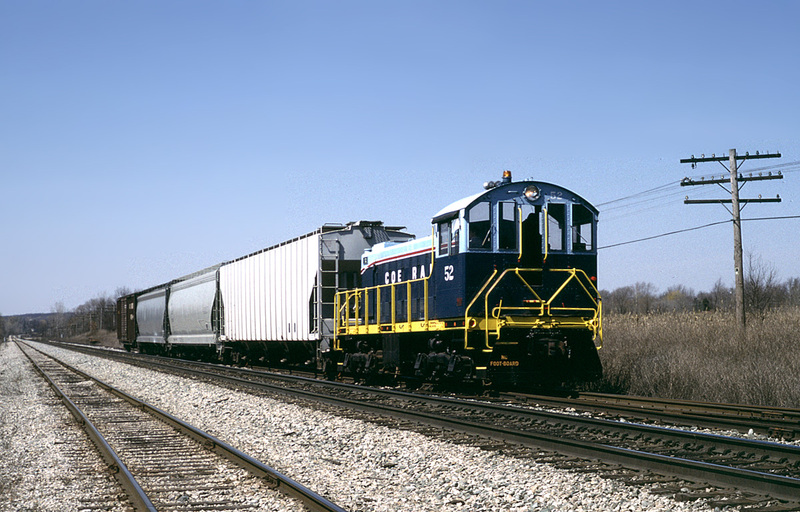 On the sunny spring day of 08 April 1990, Coe Rail Alco S2 #52 is delivering empty cars to the C&O (CSX) at Wixom, Michigan. Coe Rail (CRLE) was incorporated in 1984 and operated over a section of the former-Grand Trunk Western “Air Line” between Wixom and Walled Lake, MI. The little short line had a reasonable amount of freight customers at the time, and also operated weekend and charter excursion trains. #52 came from the Port Huron & Detroit Railroad, and is still wearing that road’s colors. Coe Rail was sold in 2006 and became the Michigan Air Line Railroad. The line was later abandoned, and scrapping took place in 2012. The blog’s author worked briefly for Coe in 1990, handling freight operations.